Home > Mood Supplements > How Can Evening Primrose Oil Help My Moods? 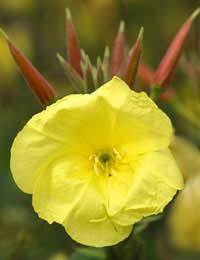 Evening primrose oil, or EPO, is thus named because the yellow flowers of this willow plant open only in the evening. Long a favourite herbal supplement for women, EPO is famous for helping to control the often debilitating mood swings that can accompany many women's menstrual cycles. Evening primrose oil works because it contains an essential fatty acid (ETA) called Gamma Linolenic Acid, or GLA. While these types of fatty acids are vital for our bodies to function properly, we cannot manufacture them ourselves so we have to get them from outside sources. Most ETAs come from the foods we eat, such as dairy products, vegetable oils and soya. When they are converted into GLA our bodies eventually turn it into prostaglandins, which the body depends on for its normal metabolic function. Among other functions, prostaglandins reduce inflammation and reduce the blood's tendency to clot. Women who suffer from pre-menstrual tension (PMT) usually lack essential fatty acids in their daily diet, leading to an overproduction of prolactin, a hormone essential to good health in the right quantity. As a result, women with this deficiency tend to suffer irritability, mood swings and depression. Herbal supplements such as evening primrose oil have proved effective in dealing with these side-effects of PMT, as well as helping with breast discomfort and bloating (water retention). It's thought that EPO can help boost the serotonin levels in our brain, helping our moods in general to be better balanced. The majority of women who suffer from PMT begin to notice symptoms five to seven days before they actually start menstruating. The simplest way to control them is to take a herbal supplement such as evening primrose oil, but there are other steps to take that can help reduce the severity of symptoms. They include cutting down on refined sugars and bulking up on fruit, veg and whole grain products. Limit salt intake (as this can cause water retention) and exercise gently and regularly. Easier said than done! Evening primrose oil is safe if taken in relatively small doses, although temporary side effects can include diarrhoea, stomach pain and nausea. People taking medication for schizophrenia should not take EPO. Always consult with your doctor before taking any herbal supplement or medication. Flaxseed or linseed oil actually contains as much, if not more, GLA than evening primrose oil, so you may want to take that instead of EPO. It just doesn't sound as nice or as soothing! You might also want to combine EPO with a B vitamin for maximum effect if your goal is to control your moods.